TO FOLLOW CHRIST: THIS IS THE CHRISTIAN’S VOCATION. 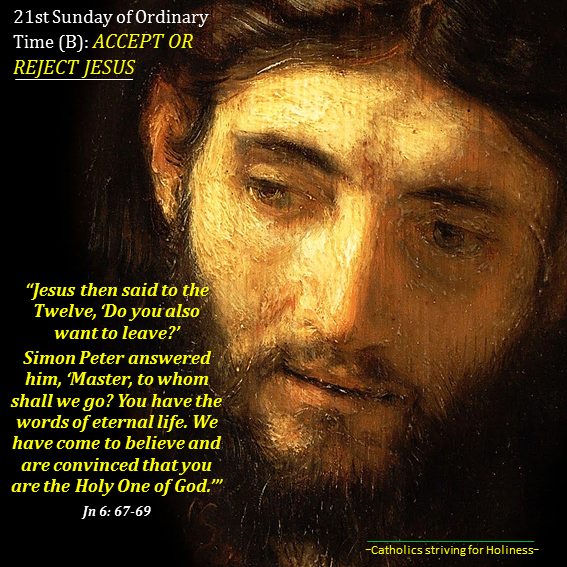 The readings of today’s Sunday Mass present to us two options from which each person has to choose and coherently live according to his choice for the rest of his life: each person can either ACCEPT or REJECT GOD. In the 1st reading (Jos 24:1–2a, 15–17, 18b), Joshua gathered all the tribes of Israel and addressed himself to all the people: “‘If it does not please you to serve the Lord, decide today whom you will serve, the gods your fathers served beyond the River or the gods of the Amorites in whose country you are now dwelling. As for me and my household, we will serve the Lord.’ But the people answered, ‘Far be it from us to forsake the Lord for the service of other gods ’”. In the 2nd reading (Eph 5:21–32), St. Paul exhorts his brothers and sisters, particularly the married couples to opt for the right choice which is “to live in love as Christ loved His Church” (v. 2a), imitating His Love for the His Church and to “Be subordinate to one another out of reverence for Christ (v.21)” because the if not, Christian marriage, which is a symbol of Christ’s love and union with His Mystical Body, the Church, would not be in accordance with God’s designs. God created us as RATIONAL BEINGS, endowed with intelligence, will and affectivity, that is with freedom, so we can make choices, but above all, so that WE WILL BE CAPABLE OF LOVING GOD AND OTHERS. GOD WANTED THE EXISTENCE OF RATIONAL CREATURES CAPABLE OF ENTERING INTO A LOVING COMMUNION WITH HIM AND SHARE HIS LIFE, WHICH IS ETERNAL HAPPINESS. But ENTERING INTO AN INTIMATE COMMUNION WITH THE BLESSED TRINITY CANNOT BE POSSIBLE WITHOUT LOVE, which in turn, IS NOT POSSIBLE WITHOUT FREEDOM, FOR AUTHENTIC LOVE, ABOVE ALL, IS AN ACT OF THE WILL. Man has to choose at one point or another regarding his destiny: either He acknowledges and accept God’s love through His Son Jesus Christ and hence live for Him and follow Him or on the contrary, reject God and live for himself. This fundamental option has to be materialized, carried out and translated in every choice and action man makes during his entire life. 3. TO FOLLOW CHRIST: THIS IS THE CHRISTIAN’S VOCATION. It is THE ONLY PATH WHICH LEADS TO COMPLETE HAPPINESS and which satisfies every man’s thirst and aspiration for a never-ending joy and bliss. Dear friends, with this Sunday’s liturgy, OUR LORD JESUS CHRIST INVITES US TO BELIEVE IN HIM AND FOLLOW HIM. we can ask ourselves IF WE ARE REALLY SERIOUS IN OUR CHRISTIAN VOCATION OF FOLLOWING CHRIST, “PARTAKING OF HIS LIFE AND OF HIS DESTINY”, DAILY, IN EVERY CHOICE, EVEN WHEN THE GOING GETS TOUGH? August 22: OUR LADY, QUEEN OF HEAVEN. Hail holy Queen, Mother of mercy!